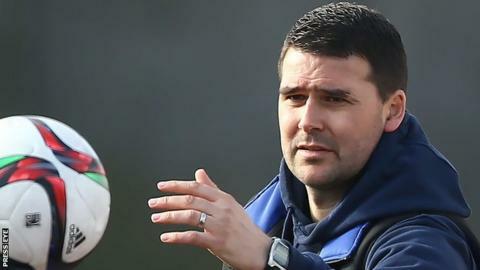 Linfield boss David Healy admits his title-chasing team cannot afford any slips when they take on bottom-placed Warrenpoint Town on Tuesday. Healy's men are five points behind champions Crusaders in the two-horse race for the league crown. After a major scare against strugglers Ballinamallard last time out, Healy wants a convincing display at Milltown. "The boys are on a good run and are upbeat but it will be tough at Warrenpoint," said Healy. "They are fighting for their lives and after beating Portadown they will want to go into their post-split fixtures on a high. "It is still in Crusaders' hands as far as the title is concerned. "They had a sizeable lead and we have managed to reduce that. It is all to play for." Warrenpoint may still be bottom of the Premiership table, but Barry Gray's men have been on a fine run and, with four home games after the split, will fancy their chances of scrambling clear of the relegation places. "We are happy to be going into the split games in touch with a number of teams," said Town boss Gray. "We have a massive four weeks ahead of us. "Linfield is obviously a huge game. They have had a couple of extra days to recover and it will be difficult to get anything out of the game." It is a case of the top two playing the bottom two in the league on Tuesday, as leaders Crusaders face one-from-bottom Ballinamallard United. Mallards boss Whitey Anderson will have been heartened by his team's unlucky 2-1 defeat at Linfield on Thursday and the Crues will be aware the trip to Fermanagh could prove tricky, having salvaged a 1-1 draw there with a late goal in October. "We have to deal with the pressure as it comes along, as do Linfield," said Crues manager Stephen Baxter. "Ballinamallard will be difficult, then we have the Irish Cup semi-final and after that it is Linfield. "So the big games keep coming."